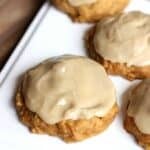 Thanksgiving was just yesterday and I have left over canned pumpkin, about 1/4 C of heavy cream and everything else I need for these cookies. 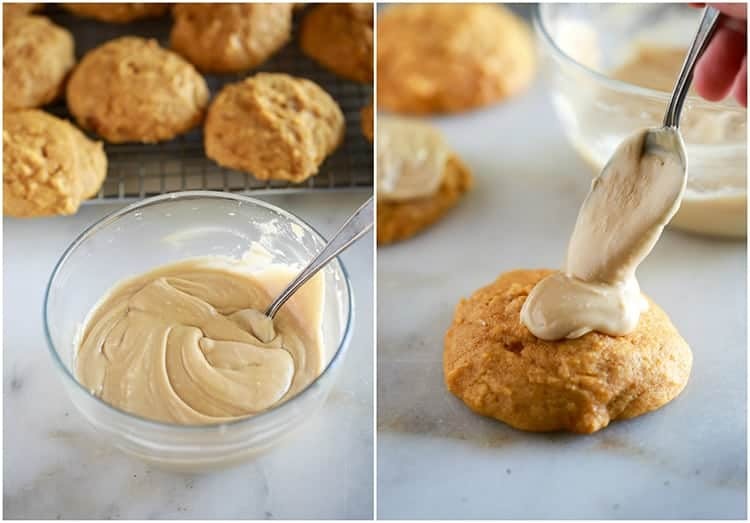 A co-worker just mentioned her favorite flavors are pumpkin and caramel…what a stroke of luck that I came upon your website and found the PERFECT recipe for cookies to give her. I always bake from scratch – there is nothing in the world better than that. I can’t even look at a box of cake mix and feel anything but ill…ha ha ha 😀 Thank you for being here – I will be looking at more of your recipes and trying them I am sure. 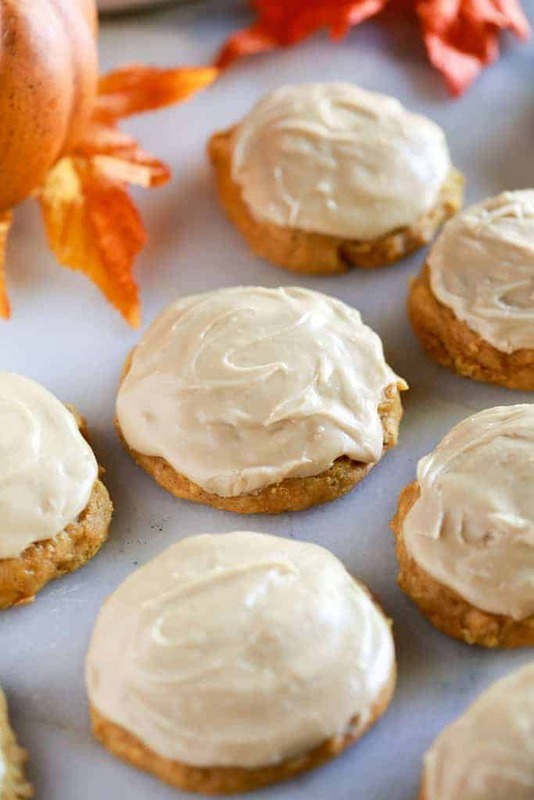 I am with you – bring on the fall baking! Thanks Terry–that is a perfect coincidence! I have no doubt your Co-Worker will LOVE them! Happy baking, and I do hope you come back! Hi Chryl, you can definitely double the recipe! Yum! Hi Joey, The frosting is fairly soft. I might suggest freezing them, and then stacking them when they’re frozen and transporting them that way. Then you could unstack them and allow them to thaw, which would only take a few minutes! These tasted so good!!! Probably some of the best cookies I’ve ever made! But what you would recommend is the best way to store them and how long do they store? Hi CJ, I’m so happy you liked them so much! I’d recommend freezing them–they don’t store super well at room temperature because they sweat…but they freeze great! Can you please indicate how many cookies you get in one batch? I need to make a bunch for my work, but I need to know how many batches I need to make. Thanks! Love, love, love these delightful cookies. 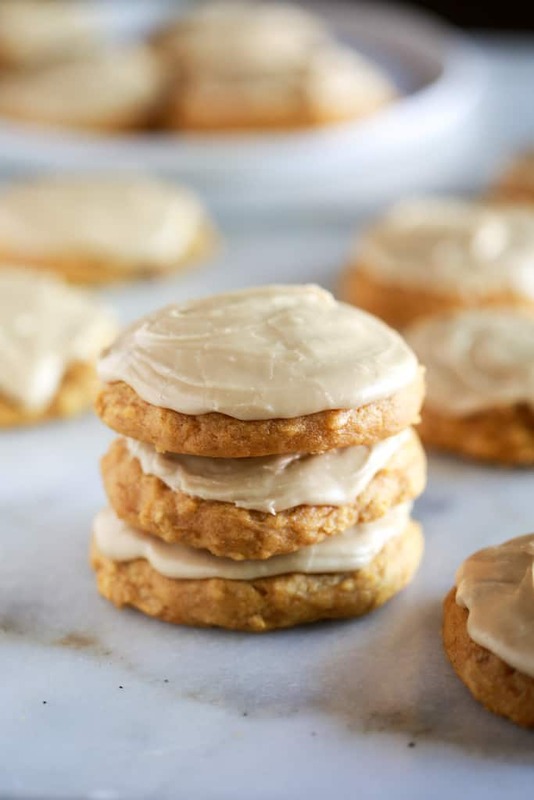 Thank you for solving the mystery about storing pumpkin cookies – these do freeze really well. We’ve re-purposed them into Whoopie Pies and Jumbo Cupcakes as well! This recipe is a winner. I found this recipe 12 days ago. Since then I have made this 4 times! I love this cookie. It is so light and perfect. The first time I made them I followed the recipe. The second time I made the frosting more of a glaze by adding more butter and cream. The third time I made a salted caramel drizzle. 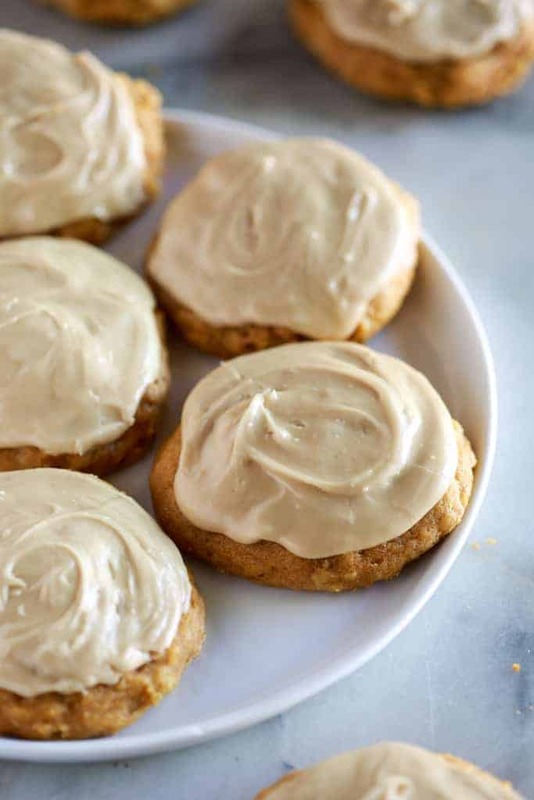 All were wonderful, but I loved the glaze and it is now a staple in my cookie book.